Come to The Local to enjoy delicious food and drink and good company. A portion of the night’s proceeds go to the rail trail. There will also be a 50/50 raffle and other prizes. This entry was posted in Warner on August 2, 2017 by Jason Mutschler. CLSRT board meetings are open to the public. We discuss upcoming actions, review prior actions concerning the trail in all the towns. This entry was posted in All Towns on August 2, 2017 by Jason Mutschler. We successfully added stone dust trail surface to the bridge at Bagley. This short extension to the trail provided us with an opportunity to try a smoother surface material. Early reports are very favorable. This entry was posted in All Towns, Warner on July 18, 2017 by Tim Blagden. Time to put a new surface on this bridge. With thanks to our many donors for their contributions, thanks to the Warner Selectboard for their permission to re-deck the bridge, thanks to our bridge design team and to Cyr Lumber & CWS Fence and Guardrail we are ready to get to work. Volunteers who want to help build a new wood deck with railings on the truss bridge over the Warner River at Bagley Field in Warner please get in touch with us. BYO tools. I have one generator, could use at least one more. We will be drilling to accommodate 3/4″ diameter Timber Bolts. Some through 15″ of material – so long bits are handy. An additional chop saw and stand could be handy. Lots of wood to toted from place to place. Help for an hour or help all day. Heavy item drop off by Brayside Apartments. Parking at Bagley Field. This entry was posted in All Towns, Uncategorized on April 28, 2017 by Tim Blagden. During January and February we received support from over 11 new donors from NH, CT, and MA. Thank you all for your support of the rail trail. How much does it cost to build a foot of the trail? As little as $2/foot if we are just applying stone dust to a clean section of trail. Costs are higher when we factor in kiosks, gates, signs, benches re-decking bridges or building new trail from scratch in areas where the old railroad grade no longer exists. We work hard to do as much as we can with volunteer labor and in-kind donations of equipment and materials to keep costs low. Your help in any amount does make a difference. Help us take two steps forward with a recurring monthly donation. At $10.00 per month you help the trail all year long. Your donation would carry the trail forward as much as five feet each month. Please help with your financial support and encourage your friends to do the same. Ask your employer if they match donations. 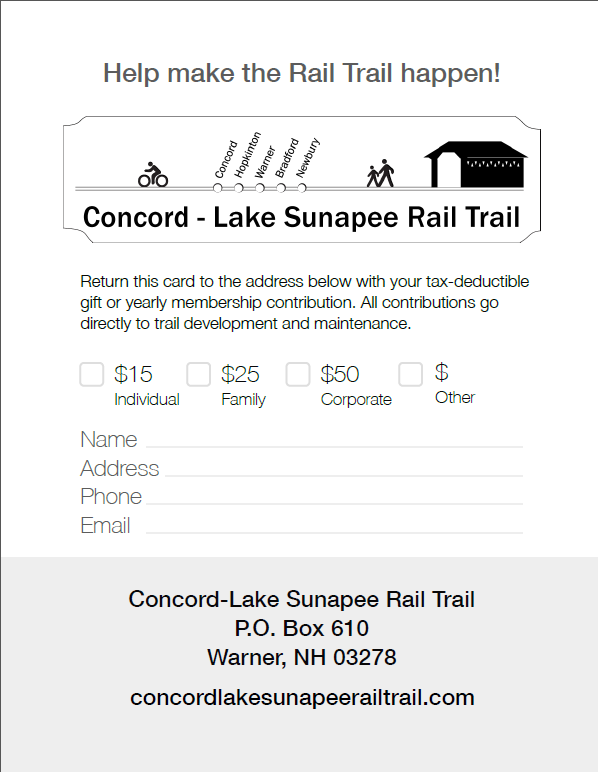 Concord-Lake Sunapee Rail Trail is a 501c3 non-profit organization. This entry was posted in All Towns on March 11, 2017 by Tim Blagden. Support the Warner Conservation Commission on 4/5/17 as they hold a public hearing to conserve property adjacent to Bagley Field. 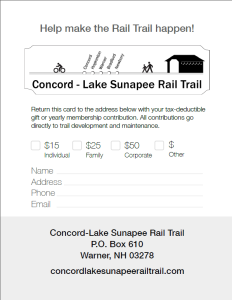 A couple of years ago the friends of the Concord-Lake Sunapee Rail Trail asked NH Department of Transportation if they would consider declaring a parcel of land in Warner surplus. We thought the parcel would be of keen interest to the Warner Conservation Commission because it borders a long stretch of the Warner River in an area where the Conservation Commission has conserved other parcels. The state has declared the parcel surplus. The town has negotiated the price down. The Conservation Commission wants to proceed with the purchase and this meeting is a necessary step in the process. Please show your support by speaking in favor of the town of Warner purchasing this parcel of land from the state of NH for $7,100 on April 5th at 7:00 PM at Warner Town Hall, 5 East Main St. Funds to come from the Conservation Fund. This parcel abuts the town owned Bagley Field property where the town soccer fields are – and where an improved section of rail trail is located. 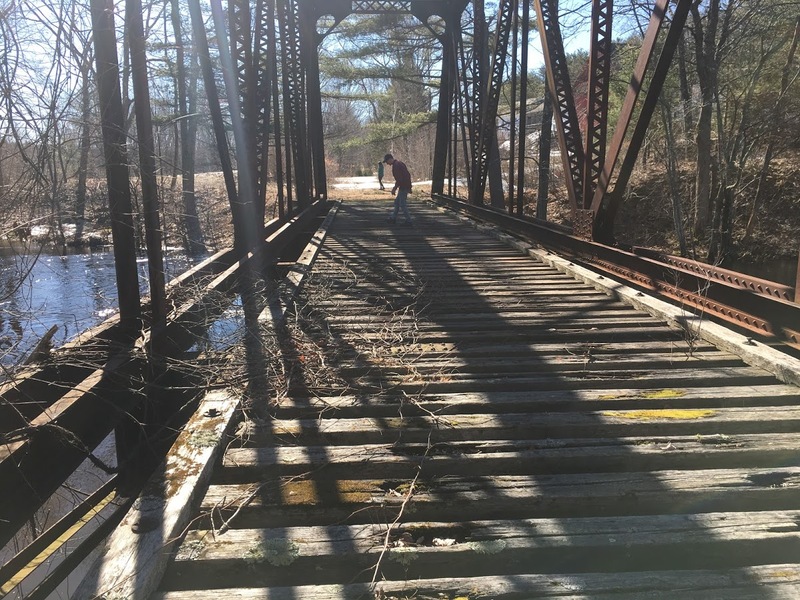 This spring we will be improving the rail trail surface on more of the Bagley Field property and re-decking an iron truss bridge extending the trail to where it meets the parcel being offered to the town. We believe the value of the parcel being offered to the town is an exceptional value for the community purely from the conservation standpoint of protecting water quality, protecting habitat, and bringing control of the property’s future use into town hands. In addition, there may come a time when the rail trail may want to cross part of this parcel along the old railroad grade. The old grade is partially on this parcel and partially on land that is within the I-89 corridor. So by itself this parcel is not all that’s needed to extend the trail towards town, but it is a necessary step. It is our goal for the trail to be an outdoor classroom that connects residents and visitors to the natural environment along the route. We believe the rail trail will provide an ideal platform for inspiring people of all ages to appreciate nature while preserving the natural habitat. This entry was posted in All Towns on March 7, 2017 by Tim Blagden. 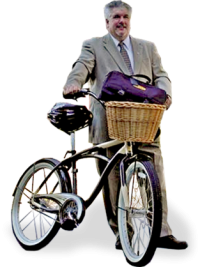 Learn about assembling rail trail corridors from Craig Della Penna on March 8th in Warner. 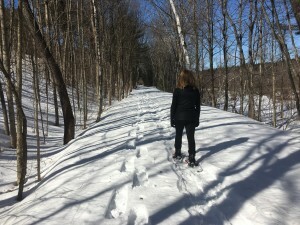 is a realtor specializing in properties near rail trails. runs a Bed & Breakfast next to a rail trail. He knows the benefits trails bring to rural communities and how – even though its not easy – its worth the effort. Craig will be speaking at 7:00 PM at the Pillsbury Free Library in Warner. The library is located at 18 East Main St, Warner, NH 03278. We hope to see you there. This entry was posted in All Towns on February 24, 2017 by Kristen Riley. Ausbon Sargent Land Trust Encourages people to “Opt Outside”. CLSRT Agrees. The Winter 2017 edition of the Ausbon Sargent Newsletter “Chatter” has the theme “Opt Outside”. “Opting Outside is one of the least expensive ways to stay healthy.” We couldn’t agree more. 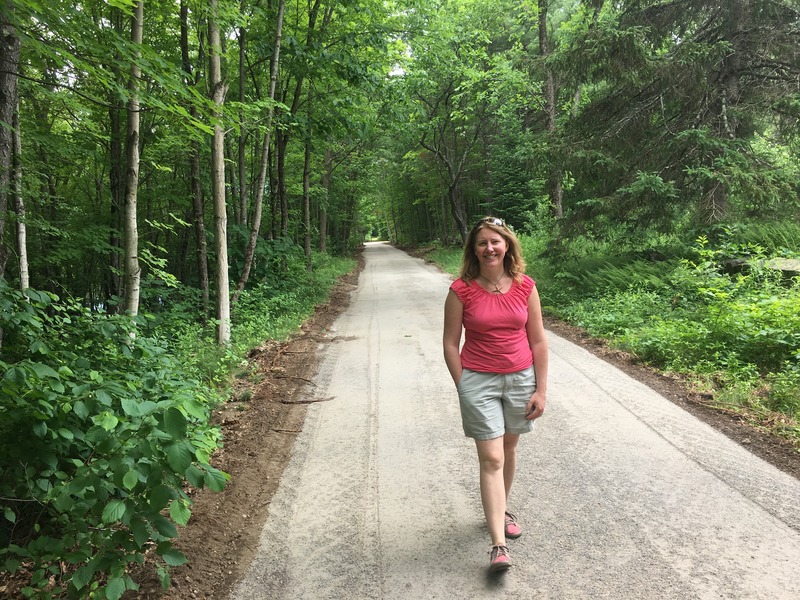 They also write, “there are many positive benefits that result from a casual walk on a woodland path.” We hope you agree and will help make the Concord-Lake Sunapee Rail Trail a reality with your donations and support. Businesses from across Warner are supporting the trail by displaying our donation cards. Please thank these retailers for their support. If we missed your business and you would like to help please get in touch. This entry was posted in All Towns on January 12, 2017 by Kristen Riley.